The Hotel is about 25 from Lisbon Airport and only 5 Kms from the popular towns of Estoril, Cascais and Sintra. It is an ideal location to relax after business meetings or as an excellent holiday location for sight-seeing. The Hotel Atlantis Sintra is about 25 kilometres from Lisbon Airport and only 5 kilometres from the popular towns of Estoril, Cascais and the very historic picturesque historic Sintra. This is an ideal location to relax after business meetings or as an excellent holiday base for sight-seeing. Each of our 178 rooms has a radio, TV, direct dialling, and there is an Express Laundry Service for personal clothes. We also provide all the traditional hotel facilities, such as a restaurant, bars and conference rooms. There is a complete Health Club, with heated pool, saunas, solarium and Turkish bath. 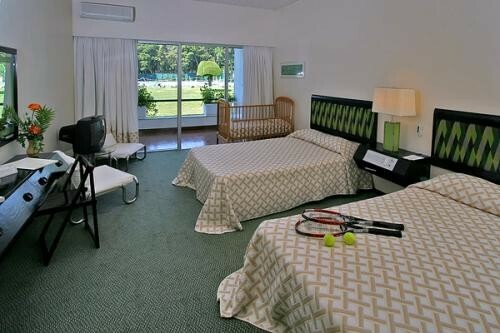 In our grounds we have two pools (one for children), tennis courts, a putting green and a volley-ball court. For golfers there is a choice of three nearby 18-hole Golf Courses. Also, minutes away there is the Estoril Tennis Club that is the home of the annual international ranking Estoril Tennis Trophy. We have the facilities to hold Conferences with two different rooms and offering catering from a small group up to 250 people. We look forward to your visit so that we can offer our traditional warm Portuguese hospitality.